Fall is in full swing, so now is the best time to lock down a stylish collection of outerwear pieces that we can keep in rotation well into the winter months. 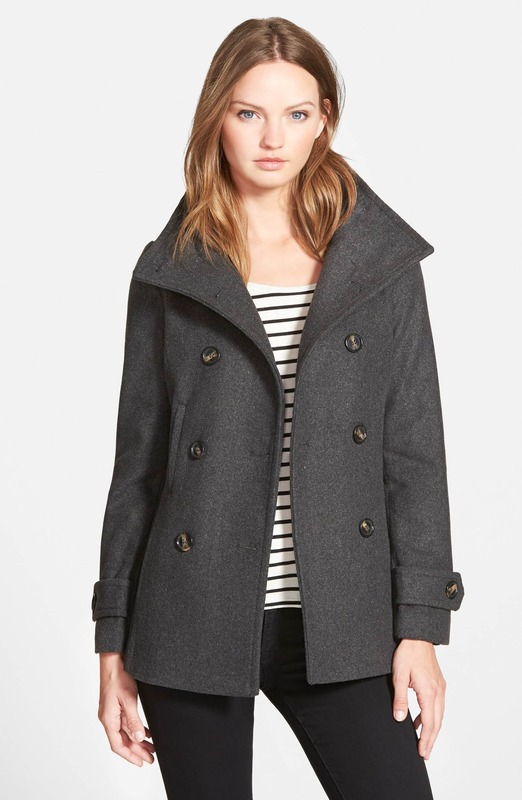 Since we love a quality piece of outerwear that’s both stylish and affordable, this double breasted peacoat that we spotted on sale at Nordstrom is a wardrobe must-have. The sale price is so good that we’re temped to treat ourselves to every color option available. Ready to Shop With Us? The Thread & Supply Double Breasted Peacoat has a lovely design with tortoiseshell buttons, a high neck for extra warmth, two side pockets and classic button tab cuffs. The best part about the coat is how it offers an overall loose fit, but subtly curves into the waist and flares out for a flattering silhouette. See it: Get the Thread & Supply Double Breasted Peacoat (marked down 35 percent off its original $58, now $38) while it’s available in four gorgeous shades. This coat comes in four shades, including charcoal (above), pink, camel (below) and black. Check out how cool the camel shade looks. 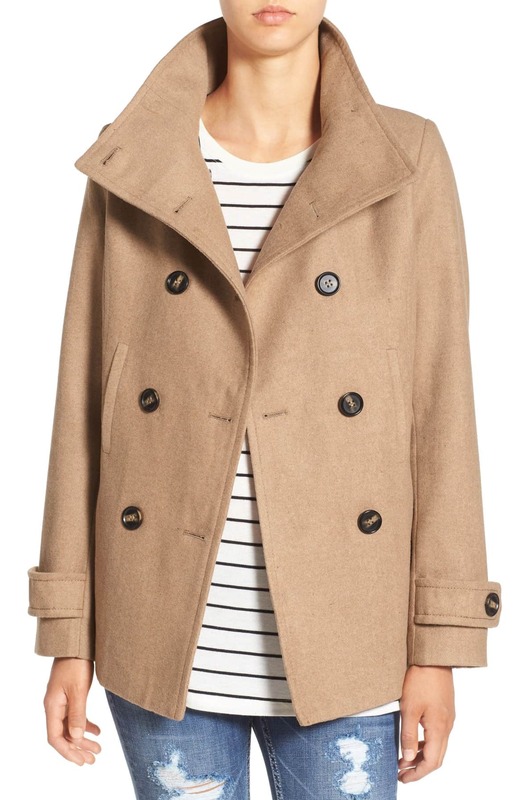 We love that the hue gives it a trench coat vibe, while we still get all the benefits of a warm, cozy peacoat. The high neck design also makes the topper a versatile outerwear piece since we can wear it all buttoned up, or leave the top flaps down so they deliver a dramatic collar. 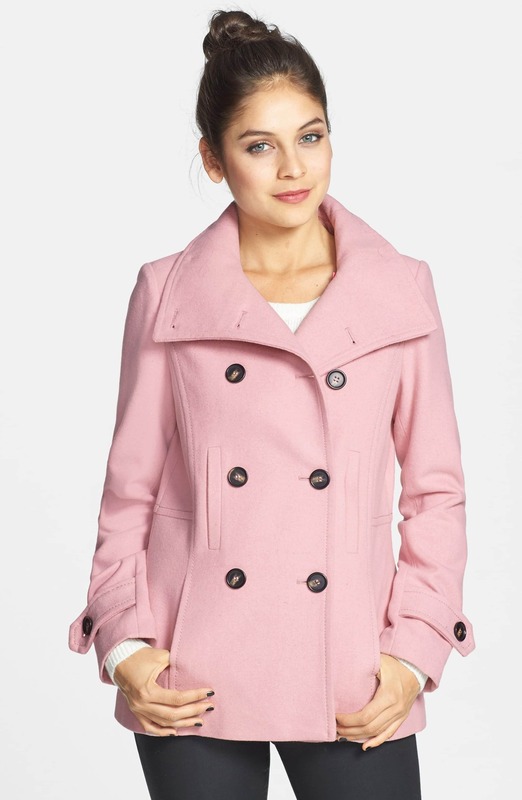 Since we love a playful pastel moment for fall, of course this pink version of the peacoat is our favorite. The coat comes in sizes ranging from extra small to extra large, which are actually 000 to 10-12. Two of the colors (blush and grey) are made with a fabric blend that includes polyester and rayon. The camel and black grey styles are made of a blend that includes wool. Both Nordstrom and shoppers note that the peacoat runs small, so it’s important to eye the size guide to get the most appropriate fit. Shoppers who purchased the coat raved most about what a great find it is for the under $40 price. Lots of reviewers acknowledged that they followed the size guide and ordered down to get the best fit and were satisfied with their choice.